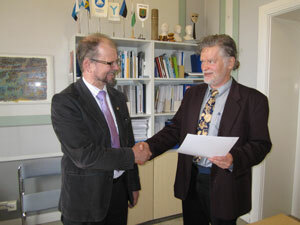 City of Loviisa and Terafox signed an agreement 05.04.2012, according to which Loviisa will sponsor FoVi project, including its constituent “In the Footsteps of the Vikings” portal and coming “Fovigame” learning game. We are very happy to be able to get support for our venture from our hometown. Connections with the town of Loviisa have been very tight, constantly, when developing the project, and we have received good feedback all the time. Communication was initiated as early as 2009, before the unification of municipalities in the environment of Loviisa for a new city of Loviisa. Originally, as main negotiators were former development director of Loviisa and Ruotsinpyhtää former mayor Risto Nieminen, and Loviisa tourism secretary Lilian Granberg, who is now on maternity leave. In their place came in early 2012 Sten Frondén, development director, formerly the mayor of Liljendal and the Loviisa basic services director, and the tourism secretary Johanna Waltonen, who are quickly and efficiently involved in the project. Loviisa town may not be famous of the Viking tourist attractions, but some of the memories of the era are though to be found here. We’ll present them in the future in more detail at the renewable Loviisa page and also in the future in a separate article, which tells about an archaeological exhibition in Loviisa museum. The exhibition is open in summer 2012. The new page of City of Loviisa will serve as a model for other cities in the future. In this context, great thanks to Grindavik and Hafnarfjordur in Iceland for their activity! We look forward to get materials about other cities, especially in Iceland, demonstrating their interest. In the photo, Loviisa Development Director Sten Frondén (left) and Terafox Managing Director Kai Kurki-Suonio.